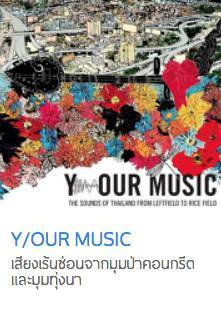 Y/OUR MUSIC immerses itself in the world of Thai musical expressions, from traditional music to labor songs and classical pop to urban indie music, spanning different locales and generations. As nine musicians display their musical expression, the rural or urban environments that influenced their sound are also explored. The hands that play traditional instruments amid the red dust clouds, the work songs being hummed in front of grains awaiting harvest, and the indie music born out of concrete basements create a melodious ecosystem. The film creates a sensory journey through some of the sounds and environments that encapsulate the music, from the noisy polluted streets of Bangkok to the calm, arid fields of Isan. While inhabiting different worlds, the musicians are linked by the same passion to bring their artistic aspirations to the fore and survive outside the pop mainstream.